Spring seems to be about as elusive as naughty bunnies hiding in the garden at night. Yes, I know, many of our gardens are still under a blanket of snow, but to us, bunnies symbolize the hope and energy spring will bring. We are sharing five of Pebble’s bunnies with you in hopes that they will be a timely reminder that spring is on its way! Boy Bunny – A classic from Pebble. Comfortable at the beach, at a 4th of July parade, he has that charming way of putting those around him at ease. 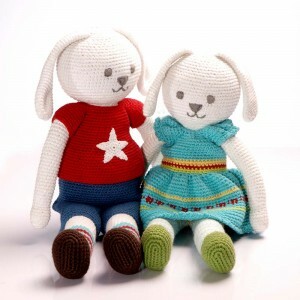 Girl Bunny – Another classic from Pebble. A sunshine-y friend in a sundress. She lights up the room and has a great imagination. 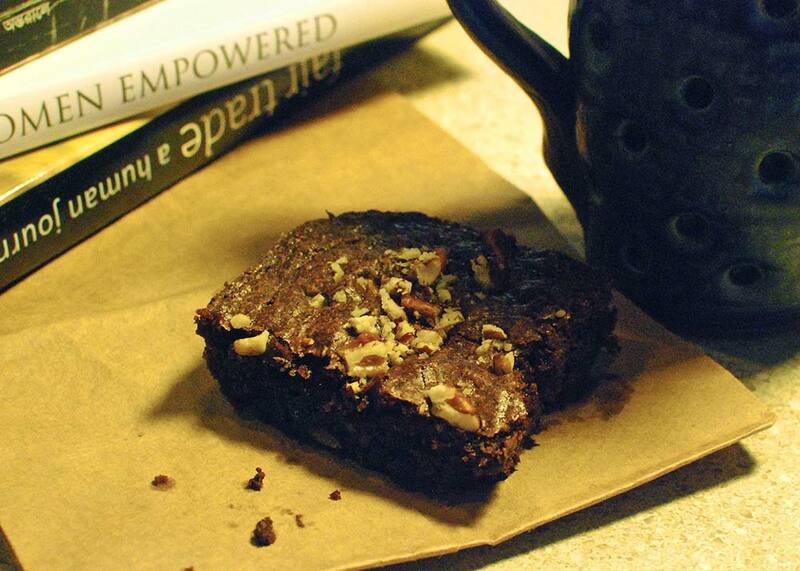 Recently spotlighted by The Talking Walnut blog, she didn’t even blush at all of the attention. Organic Motif Bunny-Star/Organic Bunny Ring Rattle – A mainstay of Pebble’s Organic Collection, these bunnies are soft and playful and loved by grandmas and grandkids in equal measure. 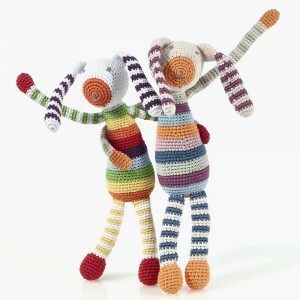 Rainbow Stripey Bunny Rattle – A quick best-seller, this character is cheerful and energetic although his prankster antics often get him in “trouble”. Organic Stripey Bunny Rattle – Showcasing the latest color-ways from Pebble, the Organic Stripey Bunny is happy-go-lucky and always ready to tell a good story. Which one is your favorite? Let us know on Facebook. Pebble products are Fair Trade and made entirely by hand. To date, Pebble provides rural employment to over 6,500 women in rural Bangladesh. To read more about Pebble’s innovative and ethical manufacturing model read our post which summarizes a case study that MIT’s Innovations Journal published about it. Life has been a bit of a blur since the holidays. Amidst a trip to Atlanta, GA for the gift show, an unusual number of snow days for the boys, the daunting task of taking inventory and rounds of the flu, a bouncy little puppy came into our lives. While the timing seems a bit crazy, we have no regrets. 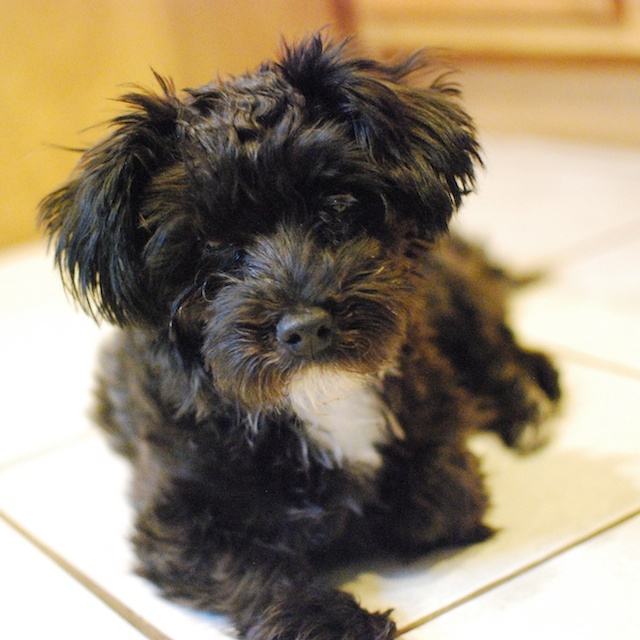 Shadow is a very loveable 6 month old Yorkiepoo and has fast become a treasured member of the family. While he was a birthday gift for our youngest son, he is adored by all of us.